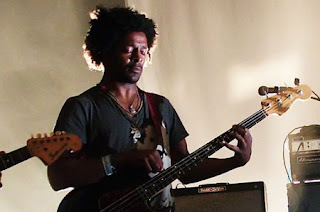 Not Your Sunday Times: TV on the Radio bassist, Gerard Smith, dies. TV on the Radio bassist, Gerard Smith, dies. I’m very sad to give word that Gerard Smith, 34, has passed away due to an ongoing battle with lung cancer. The bassist for TV on the Radio bowed out from the tour last month after his diagnosis was made public but the hope was he would get back on the road once he recovered. I had the opportunity to interview Smith in the fall of 2006 after the release of the group's mainstream breakthrough, Return To Cookie Mountain. Smith radiated a very real warmth that I’ve found to be extremely rare in the music industry. Life on the road can be grueling and unforgiving, but even after an energy draining performance, Smith didn’t even think twice about giving a budding music journalist a break by chatting with him for a few minutes about how the show went. After he talked with me, he continued to greet fans that were waiting for the group outside the venue. I intentionally avoid blogging about A&E on andrewbruss.com but this really hit home. He will be missed.